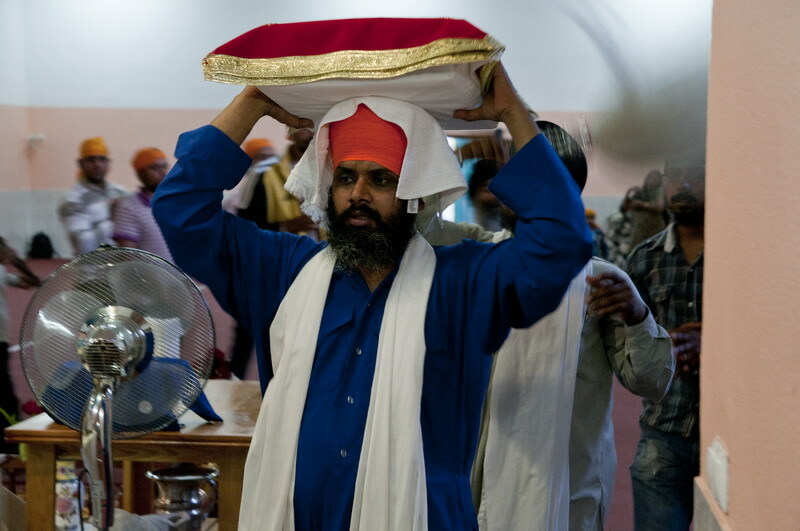 Description: Jasvir Singh, 35, holds on his head the holy book of Sikhs, Sri Guru Granth Sahib. Every night, the Guru Granth Sahib is taken from the takht, the raised platform in the prayer hall, and carried into the bed. Every morning, the Guru Granth Sahib is taken from the bed and carried to the takht. This shows the respect that Sikhs have for the Guru Granth Sahib. Caption: Jasvir Singh, 35, holds on his head the holy book of Sikhs, Sri Guru Granth Sahib. Every night, the Guru Granth Sahib is taken from the takht, the raised platform in the prayer hall, and carried into the bed. Every morning, the Guru Granth Sahib is taken from the bed and carried to the takht. This shows the respect that Sikhs have for the Guru Granth Sahib.